By voting on the books listed, you can help to determine whether a book is related to the theme of Equestrian Passions, or whether it is a non-related, but popular, book among the members of the site. If you believe a book in the list below is 'on theme' with Equestrian Passions, vote that it is relevant. (If you don't know, just skip it.) 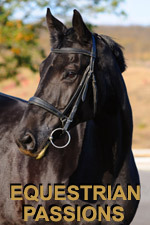 Over time, we hope to have a library of books that should be of interest to Equestrian Passions members. Amy hasn't seen Spartan since the accident - on that stormy night that changed their lives for ever. Kats life is changed forever the summer she is fourteen when she must fight for the preservation of her fathers land, the safety of her best friend, and the life of Stormwind, the horse she loves. But it was Beauty that Luke loved. He found himself sharing his hopes, dreams, and fears with the old horse. With Beauty, Luke was finally able to enjoy life again.